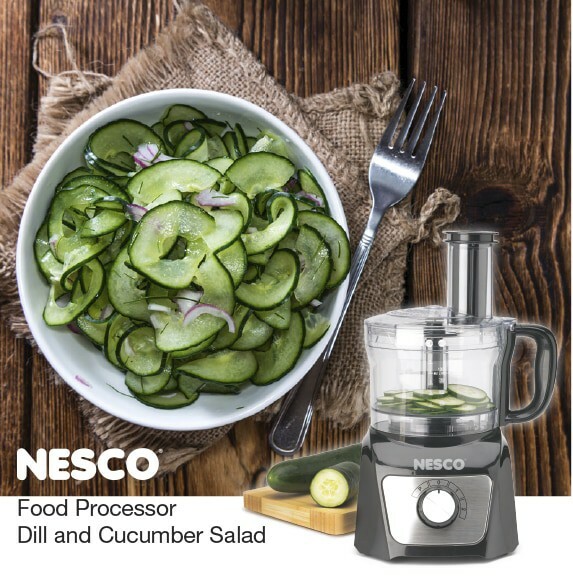 The NESCO 8 Cup Food Processor is the ideal helper when it comes to making this Dill and Cucumber Salad. It slices cucumbers evenly and fast, cutting preparation time to a fraction of hand slicing. The sweet and sour dill dressing is perfect with the cucumbers and will surely be loved by everyone. Using the slicing blade, slice cucumbers in the NESCO Food Processor. Remove to a large bowl. Next cut onion into chunks to fit into feed tube and slice in Food Processor. Place in bowl with the cucumbers. Combine cucumbers, onions and dill. In a medium size bowl combine sugar, vinegar, water and salt; stir until the sugar dissolves. Pour the liquid mixture over the cucumber mixture. Cover and refrigerate at least 2 hours before serving.